the view from my office, adding a little excitement to an otherwise slow tuesday. at last, the people with freeway views have the advantage. yep. 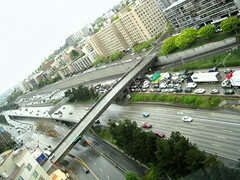 it is a picture of I-5 halted by a tanker spill. while looking for WSDOT pics, I saw something about an accident on 405, too.